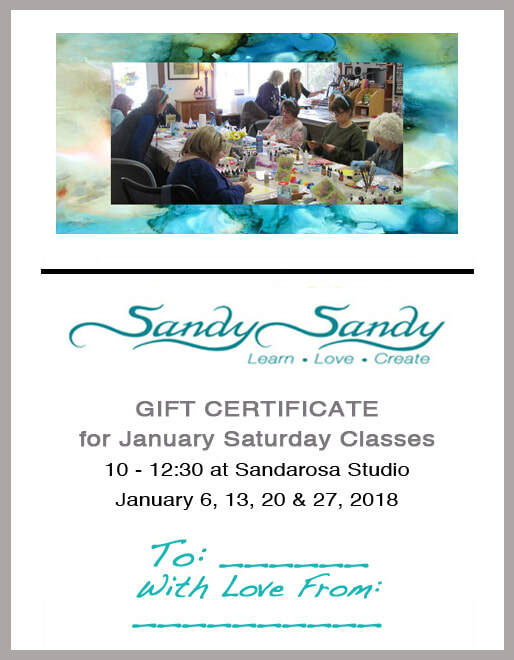 Custom Gift Certificates Are Available For all Sandy's Art & Services! Billed Through PayPal in any amount and delivered to you within 24hrs. as a PDF download. These certificates can be used for classes, workshops, supplies, original art, prints, calendars and more . . .
SEE SAMPLE - As of 12-18-17 there are still 2 spots available for January Studio Classes. Please use this form and include your full name and the full name of the recipient in the comment section below. Also include your physical mailing address. Choose a dollar amount for the gift and include a personal message. A bill will be sent to the email address provided which may be paid through PayPal account with a credit card or by sending a check to Sandy.